This ice cream truck is always parked on the corner of Boylston and Arlington Streets selling ice cream. 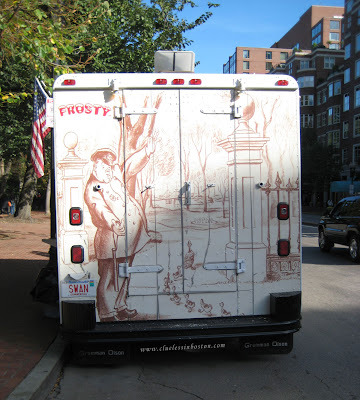 The design on the truck is from the famous book by Robert McCloskey, Make Way for Ducklings. The bronze ducklings are in the Public Garden and are a big hit with children of all ages. Thanks for all your nice comments!!! - your blog is so quick to download! !